HOUSE opposition and administration leaders commended yesterday the bravery of Filipino peacekeepers who managed to escape safely Sunday morning after battling the heavily armed Syrian rebels. Leyte (1st District) Rep. Ferdinand Martin “FM” G. Romualdez and Muntinlupa City Rep. Rodolfo “Pong” Biazon vowed to push for congressional commendation for the gallant stand shown by Filipino peacekeepers who fought the Syrian rebels who tried to overrun their United Nations (UN) encampment on the Golan Heights. “Our peacekeeping troops deserve commendation for the bravery, courage and professionalism they displayed during the attack despite being outnumbered by the heavily armed Syrian rebels. 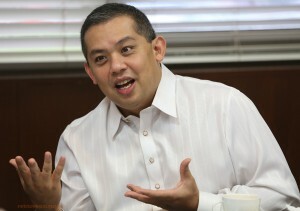 Their refusal to surrender in carrying their mandate is very laudable,” said Romualdez, head of the House independent bloc. “They demonstrated the military’s core values of courage and commitment of the country for showing highest levels of professionalism and competence. Surely, they would be admired by their peers worldwide,” he added. Biazon, who chairs the House committee on national defense, aired a similar view, saying the Filipino peacekeeping force is worthy of commendation and recognition. “Gusto kong ma-congratulate ang ating matatapang na mga sundalo doon. Hindi katulad ng iba na nandoon na sinabihan lang (na sumuko), sumurender kaagad. Kasi ang ginagawa ng ating mga sundalo doon ay nagpapaigting ng kredibilidad ng Filipino soldiers na puwede itong asahan na kanilang tutuparin ang kanilang katungkulan na kahit na ito ay maglagay sa kanila sa panganib. So congratulations sa Filipino soldiers,” Biazon said in Rowena Salvacion’s radio program Sunday morning over dzBB. If their tour of duty ends or the government decides to withdraw them from the mission, Biazon said it should be more seen as a decision to augment the troops in the countryside to address domestic problems and not because the government wants to evade international commitment following the incident. Biazon also asked the explanation of the United Nations on how it will address the security of peacekeeping forces in case a similar situation arises in the future.